Imagine walking into any room in your home and seeing it filled with light. The sun’s rays reflect across the space, making it look brighter and bigger. Imagine looking out your window and seeing a completely unobstructed view of nature: the sturdy, tall trees; the lush, green grass; the blooming, succulent flowers; and the crisp, blue sky. Without windows in your home, you wouldn’t be able to experience any of these beautiful sights for yourself. 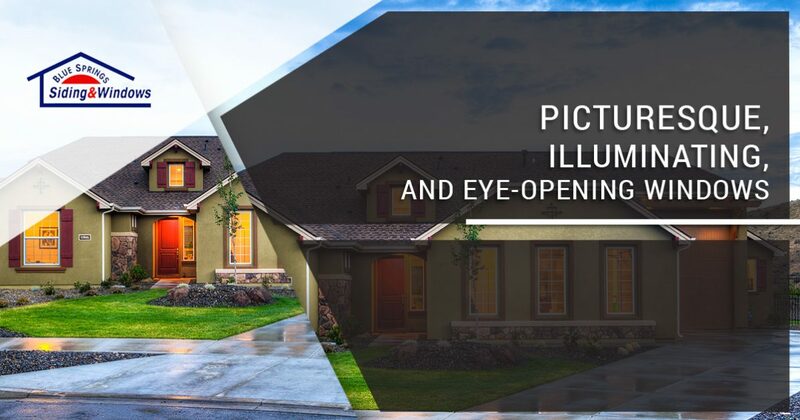 Even if you do have windows in your home, they may not provide you with the picturesque, illuminating, and eye-opening scenes you wish to see. Don’t settle for a mediocre view of your backyard or a low level of light in your home. Instead, install new windows to enhance your home and how you view the world outside it. Below, we discuss a few window types that work best to help you meet these goals. If you would like to learn more about window installations in Kansas City and the surrounding areas, then get in touch with a member of Blue Springs Siding and Windows! 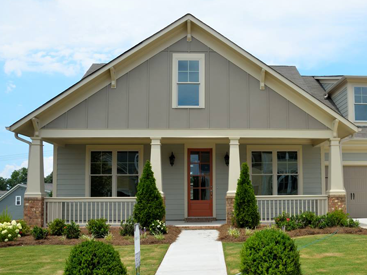 We’ll gladly help you find the perfect replacement windows for your home. Probably the most common window in the United States, casement windows serve both aesthetic and functional purposes. The glass is attached inside a frame that is held together by one or more hinges. Traditional casement windows are hinged on either side and can open either inward or outward. Casement windows that are hinged at the top are known as awning windows. These are pulled upward to open. Some casement windows, called hoppers, are hinged at the bottom and pulled from top to bottom to open. No matter which kind of casement window you choose for your home, every casement windows is equipped with a stay that holds it open. 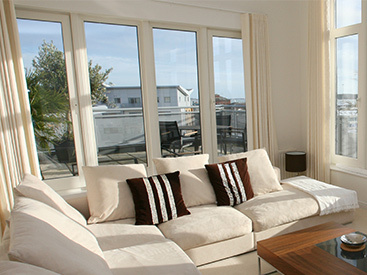 Casement windows are available in various designs, from single-pane glass windows to multiple-paned latticed windows. You can place two casement windows side by side to open up a space and allow more natural light to fill the area. Given that these windows open in any direction, you can easily clean them when they become dirty. The entire window opens completely, allowing you to let more light and air into your home. Moreover, you’ll love having an open space through which to view the beautiful area surrounding your home. 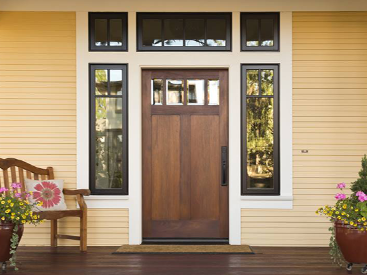 We know that safety is a priority when you’re shopping for replacement windows, and casement windows are some of the most secure windows we offer. The locks inside casement windows are shaped like hooks and are embedded within the window frame, making them incredibly difficult to break into from the outside. If you enjoy having a larger view of the outside world but don’t mind having a window that doesn’t open, then picture windows are perfect for you. These windows are typically made of one pane of glass and they usually don’t open. They merely serve an aesthetic purpose by providing you with a larger view of your property. Most homeowners love the simple build and appearance of picture windows. However, others do prefer having an extra design element attached to the windows. 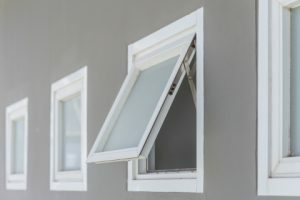 Instead of leaving the panes framed on the edges, some window experts craft frames that cross over each other to create smaller square or rectangular designs on top of the window panes. You can easily combine picture windows with other window types, or you can make them the only window in a room. And because these large, wide windows let in copious amounts of sunlight, you won’t have to use electricity as much in your home. They even make a fantastic focal point for any room, instantly drawing the eyes of your friends, family, and guests. Double-hung windows are both convenient and easy to use, so it’s no surprise that they’re some of our most popular windows. You can open these windows from either the top or bottom, making them exceptionally easy to clean. The windows also tilt inward, allowing more air to trickle into the room. These windows also come in various colors, sizes, and shapes, making them the most versatile windows on the market. Since double-hung window frames come in different materials like fiberglass, wood, aluminum, and vinyl, you can match them to any design aesthetic you want. Additionally, double-hung windows (unlike picture windows and casement windows), easily adjust to safely fit an air conditioner in the space. Both of these windows can add timeless elegance to any room in your home. Bay windows combine three or more panes and project them outwards. Bow windows, on the other hand, look just like bay windows but use four or more windows to create a curved structure. Usually, the outside panes open while the inner pane (or panes, depending on which window type you use) stays fixed in place. Both bow and bay windows create a modern, appealing look for your home. 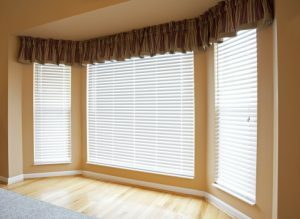 They also work perfectly for creating cross breezes in any room. And because they’re made up of so many panes of glass, they fill your home with more natural light than standard windows. Since these windows also curve outwards, they create an extra space indoors that you can use as an indoor garden space, reading nook, or breakfast area. We hope that the information in this post will help you select the perfect windows for your home. If you’re still not sure which windows will best suit your home and design preferences, then get in touch with our window experts to request more information. You can get in touch with us by filling out the form below or by coming by our showroom in Blue Springs. As window installation specialists, you can trust that we’ll help you find the perfect windows for your home.